Creative Gigaworks T20 and T40 crossover redesign. 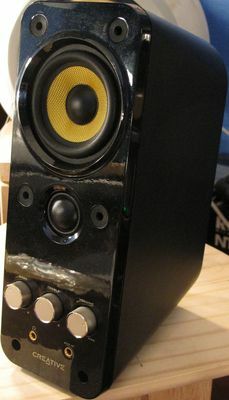 These loudspeakers first came to my attention when I saw the T40s at a friends house. My inner geeks interest was piqued so I investigated further. Listening to the stock models resulted in a mid forward overly bright balance with exaggerated and ill defined bass. Nothing particularly deep just irritating. Fiddling with the tone controls helped with the excess treble energy but the bass control, although somewhat useful in helping with the bass, also made the mid-forward tonal balance worse. Using the computers DSP helped to further reign in the issues but weren't exactly a permenant solution. Googling for measurments was somewhat useful and they did indeed point towards a peaky, underdamped alignment but also towards major issues in the critical 1-3kHz band. No wonder these sounded forward. Before I even measured these I expected the crossover to be somewhat high in frequency and with a relatively simple single cap/coil crossover. I could not have been more wrong. Cracking them open revealed a 2nd order filter on the bass driver with a single cap/resistor on the tweeter and using what appeared to be a quasi series arrangement where the woofers voice coil was placed in the return path of the tweeter leg. Measuring showed a very low crossover, around 2kHz, which surprised me, clearly the designer wasn't simply doing the least necessary to make something that sounded half decent that didn't result in dead tweeters. Bypassing the crossovers and measuring the drivers individually revealed why. Above shows the measured frequency response for the woofers used within the T40. Incidentally these are 3 ohm units, wired in series, for a nominal 6 ohm to present to the internal amplifier. Here is the obvious reason for the lower than expected xover frequency. The driver has a nasty issue between 1-2Khz that needs addressing. It's either cross over high and use a noth filter or cross over low and control the issue within the transition band of the crossover filter. Clearly a 1st order electrical filter is out of the question showing why Creative chose to go with a 2nd order, it needs that cap to try and pull down that stinking great peak just below 2kHz. The tweeters raw response shows that it is instrinsically rolling off a little below 2kHz without a filter so will require very little filtering to actually bang its output into something decent. The dip at 6kHz isn't particularly attractive and neither is the rising response but at least the speakers treble control can help solve the rising response. Mt first concern with such a low xover frequency on the tweeter was whether or not it could handle it. 19mm domes aren't known for going low gracefully especially not cheap tiny neo ones without a chamber. Measuring the tweeters distortion (at what I think was 2.83vrms) proved quite the surprise. Low 3rd and very low 4th and 5th order harmonics all the way down to 2kHz. The only fly in the ointment is some rising 2nd order that would likely prove innocuous to the ears. Clearly the tweeter wouldn't be struggling providing a steep crossover is used. The Creative designers didn't really use a steep xover but even still, for all its evils, the simple stock xover did a far better job than I was expecting. The designer put in a decent amount of thought into how to use the drivers in the cheapest possible way, but didn't omit simply for the sake of a lower RRP. This, however, is where my praise ends, the drivers were not integrated well with regards to phase, baffle step compensation was largely ignored and the tweeter could have definitely done with a more optimised crossover. Aside from this bashing though, how well the tweeter measured with respect to distortion was enough to make me look for a pair of T40s or T20s on ebay and this is exactly what I managed to find. A pair of T20s brand new in box, simply with a small manufacturing defect that meant they didn't turn on. All mine for £10, Just the 27 volt switched mode PSU brick they came with was worth that for any number of class D amplifier projects that I work on, so hurrah. Roll on the T20s. Internally the T20s are identical to the T40s, same crossover, same amplifier board, what appears to be the same tweeter, but with a marginally different woofer. The T20s using a single 6 ohm driver in place of the T40s 3 ohm drivers wired in series. For completion below is a distortion measurement for the bass driver of the T40s. The first thing to mention is that the spikes in the 1-2kHz region are from mild clipping due to the resonance issue that the drivers suffer from. Measuring takes time and this was enough (along with a quick FFT) to show that the spikes weren't attributed to the driver and that is was most certainly useable. The drivers performance isn't stellar but it is decent, certainly nothing to complain about in such a cheap loudpeaker. Clearly it doesn't have a ton of linear excursion, due to the rapidly rising bass distortion, but you cannot have everything. Measuring the T20s drivers showed up pretty much the same thing. Certainly no surprises there. Slighly less of a dip in the tweeters response compared to the T40 and of a rise too. I blame cabinet diffraction for the dip. Aside from the woofers ugly peaking issue around 2kHz wmy main issue with this design is the extremely high Qts. This has probably been done in an effort to keep costs down by using smaller, less expensive, magnets, but ported designs really need low Qts drivers to work at their best. Would a larger magnet really be too much to ask for creative? So we can have a proper bass alignement that doesn't sound terrible? Note that the above responses don't even include the port either, that's just the raw nearfield measurement of the woofer spliced onto a far field for the upper resposne. To make my T20s listenable I plugged the ports with tissue, but I digress, onto the new crossovers! As these are inexspensive loudspeakers to begin with it didn't make any sense to try and make a comparitive sows ear into a silk purse by throwing bucket loads of crossover components at them. First of all this would soak up precious cabinet volume and make the bass even worse but it would also cost more. Cheap and effective was mandatory and especially so if anyone else was wanting to try the redesigned crossovers at some point too. A crossover as expensive as the loudspeakers themselves doesn't make any sense. Thankfully this wasn't too hard. Creatives basic idea of using the woofers till around 2kHz was followed as there was no good reason not to follow this example. Controlling the peaking of the woofer with the Q of the woofers low pass is an excellent idea and is regularly used for controlling a woofers rising response. Above is the final simulated response for the T20s. Baffle step has been largely compensated for with about 4dB being applied. The horrible 2kHz issue of the woofers has been controlled and the asymmetry used in the crossover rolls the tweeter off higher than the actual intended xover frequency to help keep it nice and linear. Still with the rising response but that's what the tone controls are for! Below is the simulated reverse null showing excellent driver integration. Next up is the input impedance. These are not difficult loudspeakers to drive and every effort was made to keep them so. Initially they dipped to around 1ohm throughout the crossover region, which was obviously not acceptable! And now onto the crossovers. A simple 2nd order electrical filter on the tweeter followed by a good old fashoined Lpad. And for the woofer? Pretty much exactly the same except for different component values and a resistor. Above is a picture of the actual assembled crossover for the T20s. I removed the crossover PCB and made a new board to mount the old components on out of a piece of perspex. Hot melt glue-gun glue was used to hold them in place. By comparison the modified speakers sound excellent but they do require the tone controls be used to find an attractive tonal balance. The bass control is very effective at controlling the bass hump (turn it down!) and the treble control is also good for the high frequencies. With some baffle step compensation in place and the rest of the response reasonably flat the speakers now sound relaxed and even without grating on the ears. What puzzles me is that the revised crossover uses what? 1 tiny air cored inductor and 2 resistors vs the job creative did. These cost very little and result in a pretty much perfect xover job for what aren't necessarily the easiest of drivers to work with. Still creatives designers didn't do that bad of a job but with my hyperacusis I wasn't able to listen to them, unmodified, bcomfortably. Creative decided to use exactly the same xover for both the T20 and T40, no doubt another cost cutting exercise but my crossover for the T20s doesn't work particularly well with the T40s and requires something slightly different. Above is the simulated frequency response and below is the simulated reverse null. Not quite as flat as the T20s and with a considerably different xover approach. The T40s needed a far steeper xover to bring the drivers into decent phase alignment whilst also keeping the on axis response decently flat. The dip in the upper ovtaves is worse with the T40s than the T20s, but it's still pretty good. Again the rising response and bass hump need to be controlled with the tone controls. No surprises with the impedance plot, nice and easy. Tweeter crossever. Note the reversed polarity on the tweeter. Again an Lpad was used to attenuate the tweeter but this time a 3rd order network was necessary for the steeper acoustic crossover and for response shaping. The woofer xover doesn't really require any additional explanation. The T20 rework ended up more elegant than the T40 but both get the job done. Correction for baffle step losses, a flat frequency response that can be tuned via the tone controls and good phase integration of the drivers. FInally an amplifier modification for the T20s. This modification would also work for the T40s but the owner of the T40s wanted his speakers left in as original condition as was possible. Both loudspeaker use the TPA3123D2 from Texas Instruments. This is a decent device but is nothing special. It is single ended, doesn't support filter free operation and requires large coupling capacitors on the output to block the DC component of the single ended class D amplifier. A much better option is to use the TPA3118 series of chips instead. You listening creative? These work from slightly lower voltage rails (a couple of diode drops if you want to reduce the 27V PSU voltage down) but have the main advantage of operating as two bridgeed amplifiers. This allows out of phase switching methods to be used that significantly reduces the intrinsic EMI that the chips produce and lets the devices run filter free for short-ish cable lengths. This removes the need for any output inductors and the bridged operation not only significantly increases the output power but also removes the need for any DC coupling caps. Purely from a monetary point of view I'd expect the TPA3118 to actually work out cheaper as it doesn't need the aforementioned components, just a few cheap ferrite beads. This isn't necessarily a modification that is easy to carry out. I designed and built my own PCB, then piggy backed it onto the original PCB. This doesn't look particularly elegant but it works well. The ground plane of my PCB was soldered directly to the top side ground plane of the Creative PCB for good heatsinking of the TPA3118 and decent electrical performance. Muting control was carried over from the Creatve PCB but it isn't enough to supress a turn on thump. Some components were removed from the creative board to facilitate the modification too but all was successful. The fully modded T20s sound very nice and I use them with my electronic piano. The T40s? whenever I visit my friend and we have music on I am always impressed with how dnice they sound. Originally they irritated me and now they do far less.